If you are like most women, you spend so much time POURING your wonderful self out to others. So I decided to celebrate the launch of the new book by hosting the World's Largest INSPIRATIONAL COFFEE BREAK to give YOU the opportunity to REFILL that part of yourself that gets POURED out in the DAILY GRIND. Any woman thirsting for more meaning and fulfillment will find an uplifting treat in Inspirational Coffee Breaks for Women. This unique guide for living is overflowing with heartwarming stories, encouraging messages and rich wisdom help you discover creative, new ways to revitalize and renew your life. Outlining 12 strategies—'Ground Rules'—for pouring your heart into life, this one-of-a-kind coffee-themed approach to life fulfillment captures your heart and takes you on a personal journey toward a life filled to the brim with enjoyment. Combining insightful reflection questions with creative action steps you can easily apply to your daily life, this book supports every woman in living each day more fully. (And you don't have to be a coffee lover to enjoy it!) 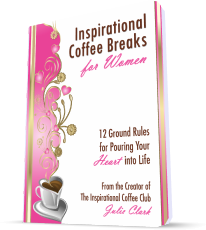 As energizing as it is inspiring, Inspirational Coffee Breaks for Womenis just the right blend of fun, motivation and encouragement to turn ordinary coffee breaks into recipes for happiness, success and joy! This beautiful book is a true dose of encouragement for your soul! "I have never read a book that I couldn't wait to read again, with highlighter in hand to mark the areas that were especially touching. It made me laugh, it made me cry. A book that truly warmed my heart and inspired my soul." "This is a MUST read book...It's unique and will definitely get you jump-started to a new you." "Whether you are a working woman, a stay-at-home mom, or a young woman just out of college, this book will touch and motivate you to become a better person. The way the author poured her heart and soul into the book to help and encourage others is truly magical. 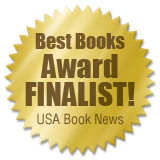 You will leave this book feeling rejuvenated and inspired." Give yourself the Ultimate Life Boost!